The other day I was searching through my closet and stumbled upon this old dress of mine. I bought this dress in high school and graduated 24 years ago so it is at least that old. The last time I put it on and thought of wearing it my youngest daughter and self proclaimed fashion expert told me it looked weird. She said the dress was cute, but that I looked like an old lady trying to be a teenager in it. Hey it still fits so personally I think that is half of the battle, but alas I followed the little diva’s advice and hung it back in the closet. 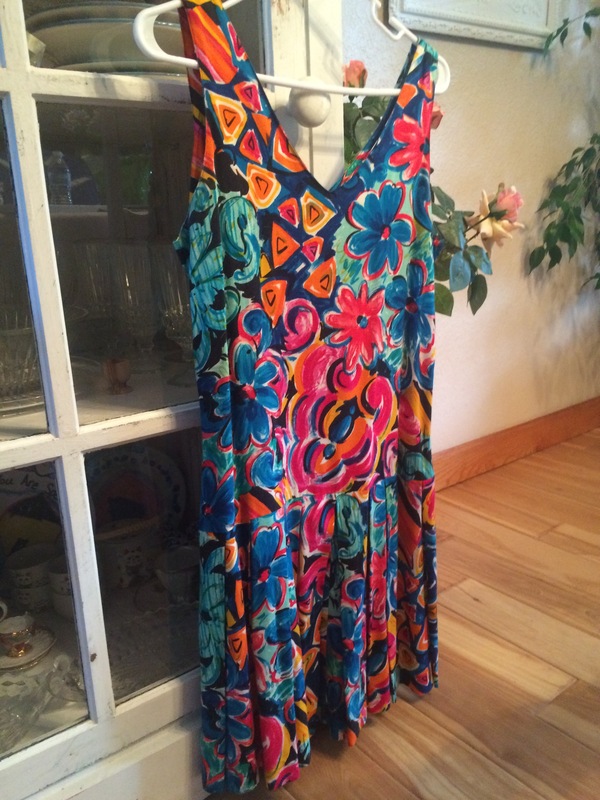 The bright pattern of this dress is what I love most and for some reason I simply can not part with it. I figure if my husband and I ever get to go to Hawaii I will wear it there. Even if I am NINETY I shall wear it!! How many of us have things or areas of our lives we just do not want to give up? That is the hardest obstacle I think there is for a person to come to know Jesus as their Lord and Savior. Satan puts it in our head that we would have to give up too much. Looking back on my life what I have given to Jesus was what was weighing my life down. My sins, grudges against others, etc… When giving him the best of me he even takes that and makes it better. Giving Jesus my all, the good, the bad, and the ugly has been the best decision of my life. He gave everything for me, how can I not fully surrender everything to him? What are you hanging on to? What is so much more important than a life of freedom, joy, peace, hope, and that is eternal?